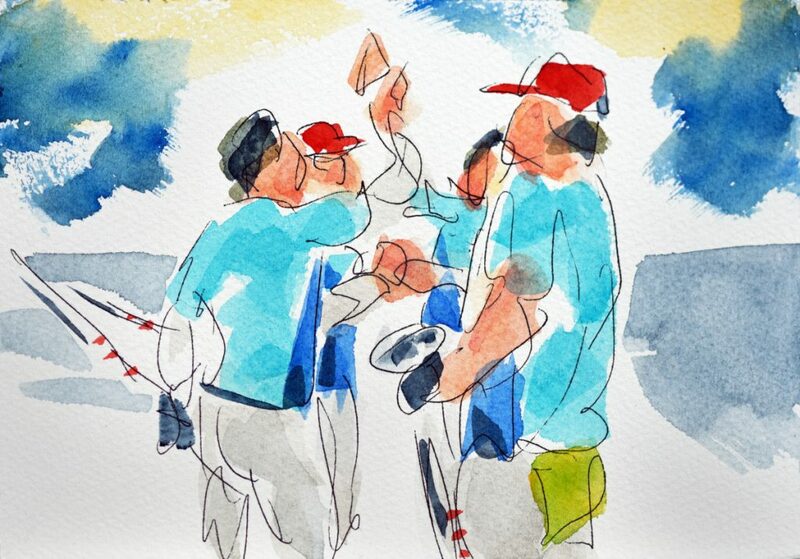 Bruce McMillan tweeted his watercolors to encourage the team in its gold-medal run. The men’s U.S. Olympic curling team got off to a rocky start in South Korea last month, and Bruce McMillan wanted to help. McMillan, of Shapleigh, is sending two of his paintings to U.S. Olympic curling skip John Shuster, including this one of team members celebrating a win over Canada, and the one below of Shuster high-kicking after another victory over Canada. After a 2-4 record had them on the brink of elimination, the men’s team went on to win a gold medal, the first ever for the United States. Coincidence? Maybe, but the team’s skip, John Shuster, appreciated McMillan’s watercolors so much that he is having prints of two of them made and framed as presents for his teammates. One depicts Shuster kicking his leg in celebration, while the other shows the whole team celebrating, both after wins over Canada. McMillan, 70, has seen his work and passions take him all over the map, literally and figuratively. The Shapleigh resident has had a long and critically acclaimed career as a children’s author, penning some 40 books and winning the Maine Library Association’s Katahdin Award for lifetime achievement in 2006. Other winners include Robert McCloskey, Dahlov Ipcar and Lois Lowry. He’s traveled the world photographing natural wonders for his children’s books. He lived with a family in Alaska for several weeks for “Salmon Summer” and roamed an island off Iceland for “Nights of the Pufflings.” He went to Antarctica for pictures for three books, including “Summer Ice.” His photos have also appeared in a slew of magazines, including Life, Natural History, People, Reader’s Digest and Yankee. McMillan’s photographer’s eye and passion for life’s dramas drew him to curling during the 2006 Olympics. He watched a very young John Shuster in his first Olympics. Always wanting to see things for himself, shortly after those Olympics, McMillan traveled to Lowell, Massachusetts, for a national curling event. From then on, he was hooked on curling, a sport that captivated Americans last month, partly because it looks like anyone can do it, and partly because the competitors have an incredible level of skill few of us can understand. 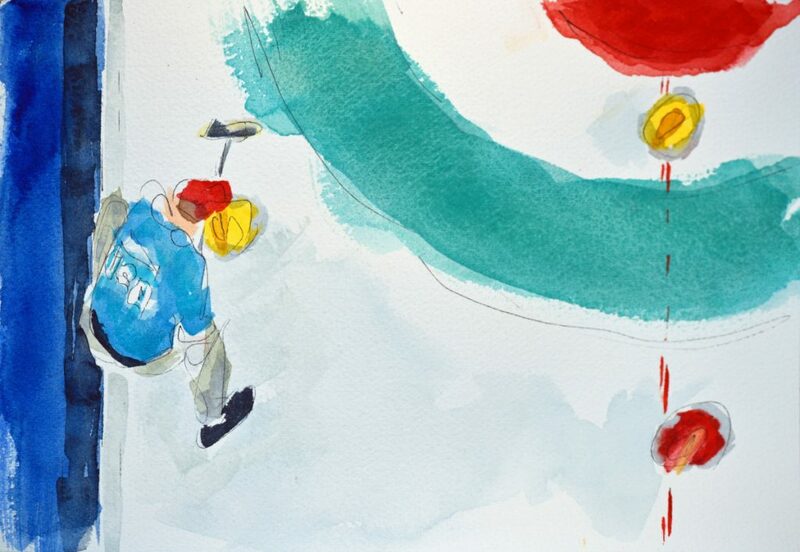 One of two watercolors Bruce McMillan of Shapleigh is sending to U.S. Olympic Curling skip John Shuster. Shuster plans to have prints framed for his teammates. The painting depicts Shuster celebrating after his team beat Canada to stay alive in the round robin portion of the competition. McMillan has never met Shuster. But he has closely watched Shuster’s ups and downs in a sport where few people know the participants’ names. The Minnesota native was just 23 in his first Olympics, in 2006, on a team that won the bronze medal. In 2010, Shuster was a skip, sort of the quarterback of the team. But his performance was poor and he was actually benched during the Olympics. He kept at it and made the Olympics again in 2014, in Russia. But his team finished ninth. So expectations weren’t high for Shuster’s team in 2018. In fact, before the 2018 Olympics, he was cut from the U.S. High Performance training program for curlers and formed his own team, “The Rejects.” Shuster lost more than 20 pounds to get into shape – running down the ice with a broom or sliding a stone for hours at a time takes more stamina than one might think. Shuster’s team earned its way into the South Korean games, got off to a 2-4 start, then went on a miraculous run and won the gold. Since then, they’ve been media darlings, interviewed on network TV morning shows and making appearances all over the country. Maybe because of that hectic schedule, Shuster didn’t respond to requests for an interview for this story. But Shuster has made time to tweet and call McMillan several times since winning gold. He talked to McMillan about getting those two watercolors, so he could frame them for his teammates. And he also asked McMillan for permission to use a poem McMillan wrote, which he tweeted to Shuster after the gold medal win. Shuster told McMillan he might have a friend of his make prints of the poem, as a way to promote curling. McMillan only took up painting with watercolors about eight years ago, after he was well-established as a children’s author and photographer. He bought watercolor sets for himself and two grandchildren, then 8 and 10 years old, as something they could do together. He now paints regularly and posts his work on his blog. He paints things he sees – a snowplow was a recent work – and posts his musings and facts he finds interesting. He paints a lot of fruit and scenes of trees and hills and the ocean as well. All the works appear on his blog, about one every couple of days. Most of the originals are for sale, usually starting at about $100. They can be ordered from his blog. His Olympic curling watercolors, about a dozen of them, were done from scenes he saw on TV. On Feb. 26, he posted “That Unbelievable Historic Eight End” (an end is like an inning in curling) after the gold medal win. It shows Shuster holding a broom and pumping a fist. McMillan paints in a dreamy, non-literal way, so there are no facial features to be seen. 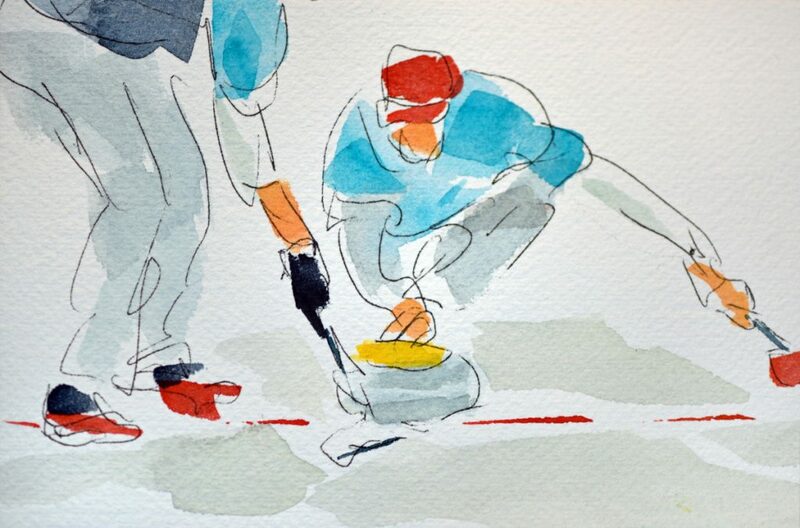 Children’s author and watercolor artist Bruce McMillan of Shapleigh tweeted to members of the U.S. Olympic Curling Team during February’s Olympics, often showing them a watercolor he did of their matches. He did a dozen curling paintings in all and is sending two to skip John Shuster. Of the 12 paintings, two are going to Shuster, and five are not for sale, being held by McMillan for a possible exhibit at some point. The other five are for sale on his blog, prices ranging from $115 to $137. As soon as McMillan started tweeting his watercolors and his words of encouragement to the Olympians, Shuster began responding. Even though he was in the middle of an Olympic competition. After the team’s first win over Canada in the Olympics, Shuster sent a picture of himself celebrating, with his leg kicking high, to McMillan. “If you painted your rendition of this one, I’d buy it in a heartbeat!” Shuster tweeted. McMillan did paint it, but wouldn’t take money. It’s one of the paintings he’s sending to Shuster. McMillan said sending the paintings to Shuster was his way of thanking him for the great memories of watching the U.S. men’s curling team and its dramatic victory. “It was really a Cinderella story, and I was just so happy to watch it,” said McMillan. 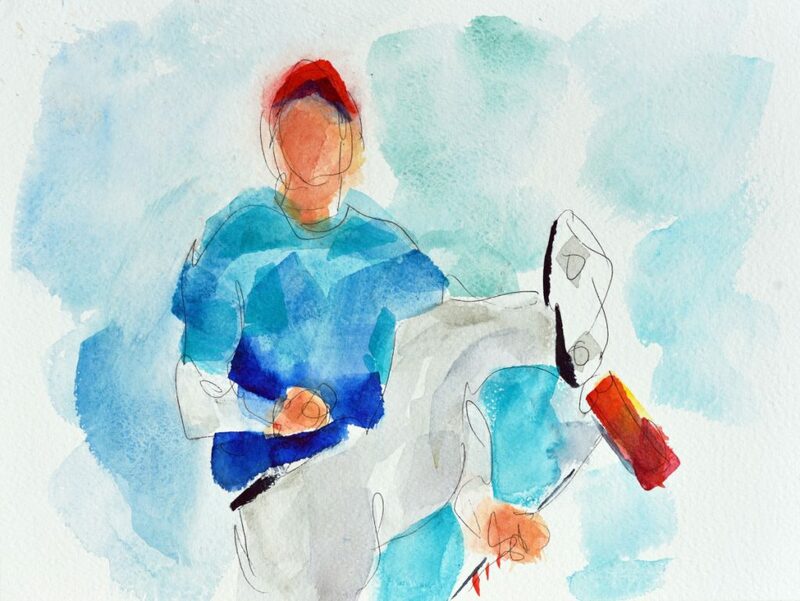 To see more of Bruce McMillan’s watercolors, including his curling scenes done during the Olympics, go to theartofbruce.blogspot.com.